"Jus in Bello" redirects here. For the Supernatural episode, see Jus in Bello (Supernatural). The law of war refers to the component of international law that regulates the conditions for war (jus ad bellum) and the conduct of warring parties (jus in bello). Laws of war define sovereignty and nationhood, states and territories, occupation, and other critical terms of international law. Among other issues, modern laws of war address declarations of war, acceptance of surrender and the treatment of prisoners of war; military necessity, along with distinction and proportionality; and the prohibition of certain weapons that may cause unnecessary suffering. The law of war is considered distinct from other bodies of law—such as the domestic law of a particular belligerent to a conflict—which may provide additional legal limits to the conduct or justification of war. Attempts to define and regulate the conduct of individuals, nations, and other agents in war and to mitigate the worst effects of war have a long history. The earliest known instances are found in the Mahabharata and the Old Testament (Torah). One should not attack chariots with cavalry; chariot warriors should attack chariots. One should not assail someone in distress, neither to scare him nor to defeat him ... War should be waged for the sake of conquest; one should not be enraged toward an enemy who is not trying to kill him. 19When you besiege a city for a long time, making war against it in order to take it, you shall not destroy its trees by wielding an axe against them. You may eat from them, but you shall not cut them down. Are the trees in the field human, that they should be besieged by you? 20Only the trees that you know are not trees for food you may destroy and cut down, that you may build siegeworks against the city that makes war with you, until it falls. Also, Deuteronomy 20:10–12, requires the Israelites to make an offer of peace to the opposing party before laying siege to their city. 10 When you draw near to a city to fight against it, offer terms of peace to it. 11And if it responds to you peaceably and it opens to you, then all the people who are found in it shall do forced labour for you and shall serve you. 12 But if it makes no peace with you, but makes war against you, then you shall besiege it. Similarly, Deuteronomy 21:10–14 requires that female captives who were forced to marry the victors of a war could not be sold as slaves. Stop, O people, that I may give you ten rules for your guidance in the battlefield. Do not commit treachery or deviate from the right path. You must not mutilate dead bodies. Neither kill a child, nor a woman, nor an aged man. Bring no harm to the trees, nor burn them with fire, especially those which are fruitful. Slay not any of the enemy's flock, save for your food. You are likely to pass by people who have devoted their lives to monastic services; leave them alone. Furthermore, Sura Al-Baqara 2:190–193 of the Quran requires that in combat Muslims are only allowed to strike back in self-defense against those who strike against them, but, on the other hand, once the enemies cease to attack, Muslims are then commanded to stop attacking. In the history of the early Christian church, many Christian writers considered that Christians could not be soldiers or fight wars. Augustine of Hippo contradicted this and wrote about 'just war' doctrine, in which he explained the circumstances when war could or could not be morally justified. In 697, Adomnan of Iona gathered Kings and church leaders from around Ireland and Scotland to Birr, where he gave them the 'Law of the Innocents', which banned killing women and children in war, and the destruction of churches. In medieval Europe, the Roman Catholic Church also began promulgating teachings on just war, reflected to some extent in movements such as the Peace and Truce of God. The impulse to restrict the extent of warfare, and especially protect the lives and property of non-combatants continued with Hugo Grotius and his attempts to write laws of war. One of the grievances enumerated in the American Declaration of Independence was that King George III "has endeavoured to bring on the inhabitants of our frontiers the merciless Indian Savages whose known rule of warfare is an undistinguished destruction of all ages, sexes and conditions". Lawmaking treaties (or conventions) — see § International treaties on the laws of war below. Custom. Not all the law of war derives from or has been incorporated in such treaties, which can refer to the continuing importance of customary law as articulated by the Martens Clause. Such customary international law is established by the general practice of nations together with their acceptance that such practice is required by law. General Principles. "Certain fundamental principles provide basic guidance. For instance, the principles of distinction, proportionality, and necessity, all of which are part of customary international law, always apply to the use of armed force". Positive international humanitarian law consists of treaties (international agreements) that directly affect the laws of war by binding consenting nations and achieving widespread consent. The opposite of positive laws of war is customary laws of war, many of which were explored at the Nuremberg War Trials. These laws define both the permissive rights of states as well as prohibitions on their conduct when dealing with irregular forces and non-signatories. 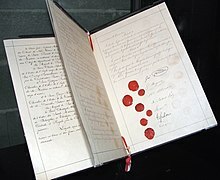 The Treaty of Armistice and Regularization of War signed in the Venezuelan city of Trujillo in November 25 and 26 1820 between the president of the Republic of Colombia, Simon Bolivar and the Chief of the Military Forces of the Spanish Kingdom, Pablo Morillo, is the precursor of the International Humanitarian Law. The Treaty of Guadalupe Hidalgo, signed and ratified by the United States and Mexico in 1848, articulates rules for any future wars, including protection of civilians and treatment of prisoners of war. 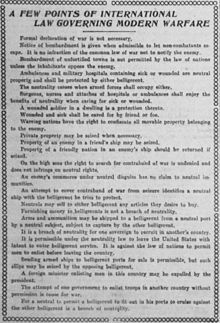 The Lieber Code, promulgated by the Union during the American Civil War, was critical in the development of the laws of land warfare. Historian Geoffrey Best called the period from 1856 to 1909 the law of war's "epoch of highest repute." The defining aspect of this period was the establishment, by states, of a positive legal or legislative foundation (i.e., written) superseding a regime based primarily on religion, chivalry, and customs. It is during this "modern" era that the international conference became the forum for debate and agreement between states and the "multilateral treaty" served as the positive mechanism for codification. In addition, the Nuremberg War Trial judgment on "The Law Relating to War Crimes and Crimes Against Humanity" held, under the guidelines Nuremberg Principles, that treaties like the Hague Convention of 1907, having been widely accepted by "all civilised nations" for about half a century, were by then part of the customary laws of war and binding on all parties whether the party was a signatory to the specific treaty or not. Interpretations of international humanitarian law change over time and this also affects the laws of war. For example, Carla Del Ponte, the chief prosecutor for the International Criminal Tribunal for the former Yugoslavia pointed out in 2001 that although there is no specific treaty ban on the use of depleted uranium projectiles, there is a developing scientific debate and concern expressed regarding the effect of the use of such projectiles and it is possible that, in future, there may be a consensus view in international legal circles that use of such projectiles violates general principles of the law applicable to use of weapons in armed conflict. This is because in the future it may be the consensus view that depleted uranium projectiles breach one or more of the following treaties: The Universal Declaration of Human Rights; the Charter of the United Nations; the Genocide Convention; the United Nations Convention Against Torture; the Geneva Conventions including Protocol I; the Convention on Conventional Weapons of 1980; the Chemical Weapons Convention; and the Convention on the Physical Protection of Nuclear Material. It has often been commented that creating laws for something as inherently lawless as war seems like a lesson in absurdity. But based on the adherence to what amounted to customary international law by warring parties through the ages, it was felt[by whom?] that codifying laws of war would be beneficial. Wars should be limited to achieving the political goals that started the war (e.g., territorial control) and should not include unnecessary destruction. Wars should be brought to an end as quickly as possible. People and property that do not contribute to the war effort should be protected against unnecessary destruction and hardship. Protecting both combatants and non-combatants from unnecessary suffering. Safeguarding certain fundamental human rights of persons who fall into the hands of the enemy, particularly prisoners of war, the wounded and sick, children, and civilians. Facilitating the restoration of peace. Military necessity, along with distinction, and proportionality, are three important principles of international humanitarian law governing the legal use of force in an armed conflict. Military necessity is governed by several constraints: an attack or action must be intended to help in the defeat of the enemy; it must be an attack on a legitimate military objective, and the harm caused to civilians or civilian property must be proportional and not excessive in relation to the concrete and direct military advantage anticipated. Proportionality is a principle under international humanitarian law governing the legal use of force in an armed conflict, whereby belligerents must make sure that the harm caused to civilians or civilian property is not excessive in relation to the concrete and direct military advantage expected by an attack on a legitimate military objective. To fulfill the purposes noted above, the laws of war place substantive limits on the lawful exercise of a belligerent's power. Generally speaking, the laws require that belligerents refrain from employing violence that is not reasonably necessary for military purposes and that belligerents conduct hostilities with regard for the principles of humanity and chivalry. However, because the laws of war are based on consensus, the content and interpretation of such laws are extensive, contested, and ever-changing. The following are particular examples of some of the substance of the laws of war, as those laws are interpreted today. Section III of the Hague Convention of 1907 required hostilities to be preceded by a reasoned declaration of war or by an ultimatum with a conditional declaration of war. Some treaties, notably the United Nations Charter (1945) Article 2, and other articles in the Charter, seek to curtail the right of member states to declare war; as does the older Kellogg–Briand Pact of 1928 for those nations who ratified it. Modern laws of war regarding conduct during war (jus in bello), such as the 1949 Geneva Conventions, provide that it is unlawful for belligerents to engage in combat without meeting certain requirements, such as wearing distinctive uniform or other distinctive signs visible at a distance, carrying weapons openly, and conducting operations in accordance with the laws and customs of war. Impersonating enemy combatants by wearing the enemy's uniform is allowed, though fighting in that uniform is unlawful perfidy, as is the taking of hostages. Combatants also must be commanded by a responsible officer. That is, a commander can be held liable in a court of law for the improper actions of his or her subordinates. There is an exception to this if the war came on so suddenly that there was no time to organize a resistance, e.g. as a result of a foreign occupation. Modern laws of war, specifically within Protocol I additional to the 1949 Geneva Conventions, prohibits attacking people parachuting from an aircraft in distress regardless of what territory they are over. Once they land in territory controlled by the enemy, they must be given an opportunity to surrender before being attacked unless it is apparent that they are engaging in a hostile act or attempting to escape. This prohibition does not apply to the dropping of airborne troops, special forces, commandos, spies, saboteurs, liaison officers, and intelligence agents. Thus, such personnel descending by parachutes are legitimate targets and, therefore, may be attacked, even if their aircraft is in distress. 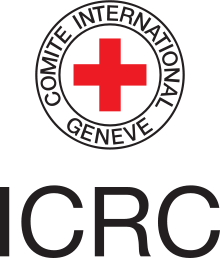 The emblem of the International Committee of the Red Cross (French: Comité international de la croix-rouge). Modern laws of war, such as the 1949 Geneva Conventions, also include prohibitions on attacking doctors, ambulances or hospital ships displaying a Red Cross, a Red Crescent, Magen David Adom, The Red Crystal, or other emblem related to the International Red Cross and Red Crescent Movement. It is also prohibited to fire at a person or vehicle bearing a white flag, since that indicates an intent to surrender or a desire to communicate. In either case, people protected by the Red Cross/Crescent/Star or white flag are expected to maintain neutrality, and may not engage in warlike acts. In fact, engaging in war activities under a protected symbol is itself a violation of the laws of war known as perfidy. Failure to follow these requirements can result in the loss of protected status and make the individual violating the requirements a lawful target. The law of war is binding not only upon States as such but also upon individuals and, in particular, the members of their armed forces. Parties are bound by the laws of war to the extent that such compliance does not interfere with achieving legitimate military goals. For example, they are obliged to make every effort to avoid damaging people and property not involved in combat or the war effort, but they are not guilty of a war crime if a bomb mistakenly or incidentally hits a residential area. By the same token, combatants that intentionally use protected people or property as human shields or camouflage are guilty of violations of the laws of war and are responsible for damage to those that should be protected. The use of contracted combatants in warfare has been an especially tricky situation for the laws of war. Some scholars claim that private security contractors appear so similar to state forces that it is unclear if acts of war are taking place by private or public agents. International law has yet to come to a consensus on this issue. During conflict, punishment for violating the laws of war may consist of a specific, deliberate and limited violation of the laws of war in reprisal. For example, in 1976, foreign soldiers fighting for the National Liberation Front of Angola (FNLA) were captured by the People's Movement for the Liberation of Angola (MPLA) during the Angolan Civil War in 1975. In the Luanda Trial, after "a regularly constituted court" found them guilty of being unlawful mercenaries, three Britons and an American were shot by a firing squad on July 10, 1976. Nine others were imprisoned for terms of 16 to 30 years. 1880 Manual of the Laws and Customs of War at Oxford. At its session in Geneva in 1874 the Institute of International Law appointed a committee to study the Brussels Declaration of the same year and to submit to the Institute its opinion and supplementary proposals on the subject. The work of the Institute led to the adoption of the Manual in 1880 and it went on to form part of the basis for the codification of the laws of war at the 1899 Hague Peace Conference. 1923 Hague Draft Rules of Aerial Warfare. Never adopted in a legally binding form. 1938 League of Nations declaration for the "Protection of Civilian Populations Against Bombing From the Air in Case of War." 1994 UN Convention on the Safety of United Nations and Associated Personnel. 1997 Ottawa Treaty - Convention on the Prohibition of the Use, Stockpiling, Production and Transfer of Anti-Personnel Mines and on their Destruction. ^ Civilian in this instance means civilians who are non-combatants. Article 51.3 of Protocol I to the Geneva Conventions explains that "Civilians shall enjoy the protection afforded by this section, unless and for such time as they take a direct part in hostilities". ^ "Deuteronomy:19-20, The Holy Bible, English Standard Version. ESV". Crossway Bibles. Retrieved 2016-12-15. ^ "Deuteronomy 20:10–12, The Holy Bible, English Standard Version". Crossway Bibles. Retrieved 2016-12-15. ^ "Deuteronomy 21:10-14, The Holy Bible, English Standard Version". Crossway Bibles. Retrieved 2016-12-15. ^ Al-Muwatta; Book 21, Number 21.3.10. ^ "Publicaciones Defensa". Publicaciones Defensa. Retrieved 2019-03-07. ^ "Avalon Project - Treaty of Guadalupe Hidalgo; February 2, 1848". Avalon.law.yale.edu. Retrieved 2019-03-07. ^ See, e.g., Doty, Grant R. (1998). "THE UNITED STATES AND THE DEVELOPMENT OF THE LAWS OF LAND WARFARE" (PDF). Military Law Review. 156: 224. ^ GEOFFREY BEST, HUMANITY IN WARFARE 129 (1980). ^ 2 L. OPPENHEIM, INTERNATIONAL LAW §§ 67–69 (H. Lauterpacht ed., 7th ed. 1952). ^ Judgement : The Law Relating to War Crimes and Crimes Against Humanity contained in the Avalon Project archive at Yale Law School. ^ "The Final Report to the Prosecutor by the Committee Established to Review the NATO Bombing Campaign Against the Federal Republic of Yugoslavia: Use of Depleted Uranium Projectiles". Un.org. 2007-03-05. Retrieved 2013-07-06. ^ Article 52 of Additional Protocol I to the Geneva Conventions provides a widely accepted definition of military objective: "In so far as objects are concerned, military objectives are limited to those objects which by their nature, location, purpose or use make an effective contribution to military action and whose total or partial destruction, capture or neutralization, in the circumstances ruling at the time, offers a definite military advantage" (Source: Moreno-Ocampo 2006, page 5, footnote 11). ^ a b Moreno-Ocampo 2006, See section "Allegations concerning War Crimes" Pages 4,5. ^ Greenberg 2011, Illegal Targeting of Civilians. ^ Jefferson D. Reynolds. "Collateral Damage on the 21st century battlefield: Enemy exploitation of the law of armed conflict, and the struggle for a moral high ground". Air Force Law Review Volume 56, 2005(PDF) Page 57/58 "if international law is not enforced, persistent violations can conceivably be adopted as customary practice, permitting conduct that was once prohibited"
^ Roberts & Guelff 2000. ^ Joan T. Phillips. List of documents and web links relating to the law of armed conflict in air and space operations, May 2006. Bibliographer, Muir S. Fairchild Research Information Center Maxwell (United States) Air Force Base, Alabama. ^ "Treaties, States parties, and Commentaries - Geneva Convention, 1864". ihl-databases.icrc.org. ^ a b Brussels Conference of 1874 ICRC cites D.Schindler and J.Toman, The Laws of Armed Conflicts, Martinus Nihjoff Publisher, 1988, pp. 22–34. ^ "International Committee of the Red Cross". International Committee of the Red Cross. 3 October 2013. ^ "Convention on the Safety of United Nations and Associated Personnel". Un.org. 1995-12-31. Retrieved 2013-07-06. The Yearbook of International Humanitarian Law and free access to a Documentation Database of primary source materials. International Law on the Bombing of Civilians (Gene Dannen). What is a war crime? BBC online 31 July 2003 (Tarik Kafala).